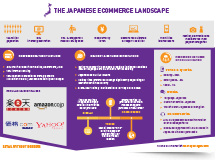 Japan ranks as the 4th ecommerce market in the word, with a high internet penetration, the ecommerce is valued US$111.33bn. Meet a market that is an opportunity for your business. This fact sheet provides key insights on how to tailor your international strategy to boost online success when selling into Japan and highlights the dos and don’ts for growth in the Asia-Pacific country.